Sunken schooners, frozen lakes, seaweed forests – you won’t find this in the Caribbean. THERE WILL ALWAYS be a portion of divers for whom scuba is strictly a warm-weather sport. As soon as the first fall chills hit, they either hang up their shorty wetsuits for the season or head to the tropics. Cold water, however, is where the real adventure happens. The cold-water sites outside of the equatorial resort belt contain millions of wrecks and unusual wildlife that the resort crowd never gets to see. From Atlantic ship graveyards to swimming with schools of hammerheads, being comfortable with chilly water opens up a world of possibilities. These are five of our favorite reasons to brave the cold. Once Britain’s chief naval base, the natural harbor of Scapa Flow in the Orkney Islands is a wreck diver’s history museum. The main attraction is the wreckage of Germany’s World War I-era fleet, scuttled following its capture by British forces. With its sandy bottom and shallow water, most of Scapa Flow’s wrecks are accessible to recreational divers, a fact which has helped make it one of the UK’s most popular dive spots. Divers looking to visit the wrecks need to get a permit through a local dive shop, as some of the ships in Scapa Flow are protected as British war graves. The Great Lakes contain some of the world’s best-preserved shipwrecks, some of which date back centuries. One of the greatest spots to see them is the Straits of Mackinac, which connect Lake Michigan to Lake Huron. Historically known as a dangerous passage, the straits contain dozens of shipwrecks, at least 16 of which have been identified, located at depths ranging from 10 feet to over 200 feet. Experienced divers can also visit Mackinac Falls, a 110-foot-tall “drowned waterfall” discovered in the straits in 2007. Portland is one of those places that’s dived extensively by locals and almost never by anyone else. If you can get over the current and occasionally poor visibility, Portland has some surprisingly varied diving, including shipwrecks and crumbling Civil War-era forts. Sites around the city’s harbor offer a chance to dive in a working port with local wildlife, like flounder and Maine lobsters. The best way to get to know Portland’s diving is to go with a local buddy. 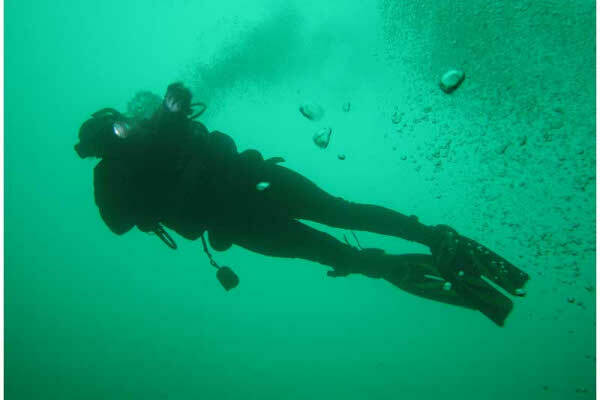 Many of Portland’s dive shops organize after-work dives at local spots. Despite sitting on the equator, the waters of the Galapagos Marine Reserve are anything but warm, thanks to the Antarctic Humboldt current that flows through the islands. The reserve hosts a stunning collection of marine life, including rays, sharks, sea snakes, turtles, penguins, and sea lions. Due to its depth and unpredictable water conditions, Galapagos isn’t a dive for beginners. Divers should be in relatively good shape and comfortable with navigating in strong cross-current before they attempt to dive the reserve. It may not be easy, but diving around the Antarctic ice is the ultimate cold-water scuba adventure. The rewards for those few who make the effort are otherworldly ice formations and visibility topping 500 feet, not to mention mad bragging rights. Unless you happen to be a professional polar explorer, your best bet is to go with an organized expedition. Eco-Photo Explorers, Dive Adventures, and Victory Adventure Expeditions all run dive trips to Antarctica. Tell us about your own favorite cold-water dives in the comments section.